Happy Tuesday, readers! Just passing along the word about another great contest sponsored by Metalhit and Metal Maniacs. 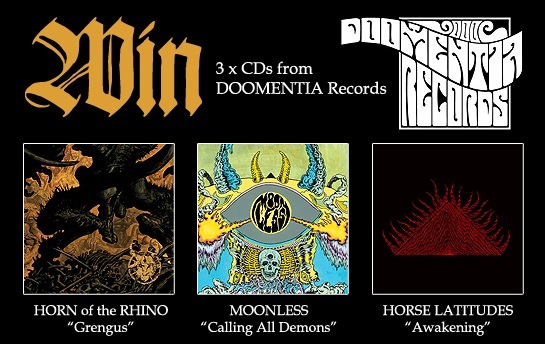 This one offers you the chance to pick up three brand new CDs from Doomentia Records! All you have to do to enter is CLICK HERE, then fill out your name and address. Good luck! This entry was posted in Contests, Free Stuff, New Releases and tagged Doomentia, Horn of the Rhino, Horse Latitudes, Metal Maniacs, Metalhit, Moonless. Bookmark the permalink. You know when the winner is anounced? Looking through their contest archive I see that there was one that started around the middle of March which is now closed but does not list any winners; the previous one started about mid-February and does name the winners. This one was announced on the 30th of April, so if I had to guess, I would say the contests seem to be about a month long, and then the winners will be announced possibly sometime in the month following that? It looks like that’s how they usually work, but I don’t really know all of the details.